Although an investment in energy efficiency does not offer direct cash payments or a potential for capital appreciation, it does offer significant amounts of potential savings. Energy efficiency savings can come in the form of income tax credits for energy efficiency, rebate programs, and immediate savings on electricity bills. 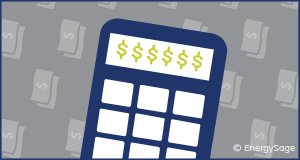 To get the most accurate measure of your savings, you’ll need an energy efficiency calculator. Federal tax credits are directly deductible from overall tax liabilities, and are thus guaranteed to have greater financial benefits than a rebate of equal value. In recent years, there have been federal tax incentives available for energy efficiency purchases. If a homeowner purchased energy efficient products in 2015 or 2016, they were eligible for federal income tax credits. There are also state rebate programs that have a wider range of products and rebate amounts, going as low as $10 for CFL lightbulbs to $1,000 for larger equipment. Rebates also come in a variety of forms such as bill credits, discounts, and instant, online, or mail-in rebates. Rebates are available for purchases and installation costs incurred within the current calendar year. Last but certainly not least, energy efficient products can result in immediate and significant utility bill reductions as soon as they are installed. Energy-efficient refrigerators, air conditioners, and other products will produce automatic savings by using less energy, losing less energy as waste, or a combination of both. Due to the passive accumulation of savings over the lifetime of the product, consumers essentially enjoy an “implicit return” from their investments in energy efficiency. Interested? You can calculate the potential financial benefits of various products with the energy and cost-savings calculators for energy-efficient products provided by the Department of Energy. Energy efficient products and services can cost more than conventional ones, turning many consumers away and towards the purchasing of more traditional appliances and services. However, the electricity savings you see from energy efficient measures should eventually offset their extra cost, which provides an implicit return on investment (ROI) when compared to the lifetime costs of adopting more conventional products. To calculate the time it will take to comparatively break-even on energy efficient purchases, you need to know the type and specific energy requirements of the product, as well as the cost and energy requirements of a comparable conventional product. The features of your home and the cost of electricity where you live will give an even more accurate picture. 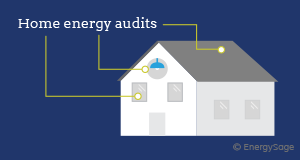 Home energy audits that pinpoint the sources of unnecessary energy waste can help to suggest appropriate actions for your home, but to get a ballpark figure, the Department of Energy offers a number of Excel-based energy efficiency calculators. The implicit “income” that comes in the form of utility bill savings is unique in that it increases over time. The most recently released Residential Energy Consumption Survey Data in 2015 estimated the annual energy expenditure for a US household was $1,856, a slight decline from 2009 numbers. During this same period, annual electricity consumption per household actually fell from 89.6 million to 77.1 million Btu per household ­­– meaning that more staic household energy expenditures came from rising energy costs, not increased usage. As energy efficiency measures help households avoid these rising energy costs, our analysis shows that they result, on average, in an additional 1.72% real annual return per unit of energy saved – about the same rate as a five-year Treasury bond. Although this is an attractive bonus, it should be stated that historical price movements alone – they are primarily dependent on external developments in environmental regulations and fossil fuel prices.